LONDON, 22nd NOVEMBER 2018, EZVIZ Inc., the global smart home security brand, is ensuring consumers have complete peace of mind in knowing their homes are secure and protected with the introduction of its ezWireless CCTV kit and analogue ‘Everyday’ and ‘Crispr’ wired CCTV kits. The EzWireless CCTV kit is available from Very and Rymans from £399.99 whilst the analogue kits are available from Rymans and Toolstation from £198.98. All of the kits are weatherproof (IP66), feature motion detection and night vision and work with IFTTT & EZVIZ Alarm Systems. 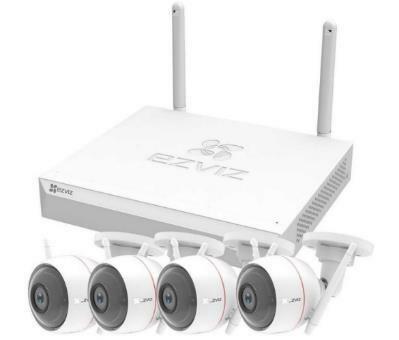 The ezWireless CCTV Kit is a comprehensive Wi-Fi smart security camera package which comes complete with 4x ezGuard Plus cameras and a Network Video Recorder (NVR) with 1TB memory capacity to ensure every moment is captured. The ezGuard 1080p resolution Wi-Fi cameras have a built-in strobe light and 100db alarm to help deter intruders or unexpected guests. This can be set automatically to activate upon movement detection or manually via the EZVIZ app on smartphones and has the ability to communicate with the two-way audio feature. The free EZVIZ app can also manage sensitivity levels, select specific areas to monitor and set many other features for the cameras. The system can be linked to the EZVIZ alarm and pairs cameras to specific sensor devices. The kit has a quick and easy set-up as the cameras have been paired to the NVR, which means all users have to do is set up the NVR itself then they are good to go! The ezNVR is capable of holding up to 8 x high definition Wi-Fi cameras and has multi-split screens to help cover the entirety of a home or store. Dual antennas mean the cameras have the best possible connectivity to a Wi-Fi network and it’s possible to hardwire via an Ethernet if required. With accessories in the box to help mount the cameras, being weatherproof and having up to 100m of visual range, the ezWireless CCTV Kit is a great solution for improving security and ensuring complete peace of mind. The EZVIZ Everyday range of CCTV kits combine a comprehensive DVR with a 1TB memory capacity included (can be upgraded up to 6TB) to capture every moment, as well as two or four weatherproof (IP66) 1080p analogue cameras, giving a complete HD security solution. The DVR has a 4 channel or 8 channel option, dependent on model, with high definition analogue cameras and has the option for a split screen to help cover all areas of a property. Motion detection alerts can be sent to a smartphone via the EZVIZ app when movement is detected and superb clear night vision of up to 30m means users can rest assured high quality footage will be captured even at night. The ‘Crispr’ BD2848B1 (8ch x 8cam) 4MP CCTV kit features superb clear EXIR Night Vision technology, with up to 30m range. Even when there’s no light, EXIR kits still give amazingly clear video. When it’s dark the cameras create a floodlight effect rather than a spotlight like many traditional systems for maximum exposure of any unwelcome guests. H.265+ video coding technology is also built-in on the BD2848B1 set for improving data compression and HDD efficiency, meaning users get more footage for their storage (up to 60% more than traditional H.264). The EZVIZ 4K 8MP EXIR CCTV Kits comprises of the UN-1484A2 (8ch x 4cam) 4MP Network Security Camera Kit and the UN-1884A2 (4ch x 4cam) Network Security Camera Kits. The range combines a comprehensive NVR that has a 2TB memory capacity (can be upgraded up to 6TB) to ensure every moment is captured, as well as 4 x weatherproof (IP67) 8MP network cameras giving a superior quality security solution for properties. One 4K Ultra camera is the equivalent of four 4K 1080p HD resolution cameras combined. The NVR is available in 4 channel & 8 Channel variants dependent on model, to hold 4 or 8 cameras respectively. Both models allow users to have multi-split screen monitoring to help cover all of a home or store. With POE (Power over Ethernet) connectivity the cameras can be powered via the Ethernet cables, thus no need for additional wiring or mains power solutions. Video analytic options are also available on the 4K models giving users the ability to set a line between two points in the video frame and configure detection settings to begin recording and send notifications when encroached. Intelligent analytics allow users to choose which direction the line is crossed to activate detection settings. In addition, it is also possible to set zones based on a manually set quadrilateral point system and time threshold, further minimising false alarms by increasing accuracy of actual intrusions. It also features the same EXIR night vision technology and H.265 video coding technology as the EZVIZ BD2848B1. The ezWireless CCTV kit is available from Very and Rymans from £399.99 and the analogue kits are available from Rymans and Toolstation from £198.98 with more CCTV Kits available in key retailers soon.